In Cunningham Park along the Long Island Expressway and Grand Central Parkway in Queens, hiking trails are unmarked and the thorny-thick brush is shaded by towering oak and tulip trees at least 150 feet tall and 200 years old. For humans the usual lure of the park, with about 240 acres of forestland, is bike paths, tennis courts and picnic tables. But the forest — of which an estimated 60 acres has been untouched and unexplored over decades — has freshwater wetlands and vernal pools that are a haven for native frogs, redback salamanders and migratory birds such as colorful spring warblers from South America. The pristine area also has attracted a flock of biologists and graduate students from across the nation. With the Natural Areas Conservancy, they spent two years mapping 10,000 acres of city forest, wetlands and grasslands and creating an inventory of plants, animal and insects. Starting Monday, an interactive map is available on the conservancy’s web site, where New Yorkers can put names to the 2,100 plants, 350 birds and 200 bees and 180 animals that live in the city’s 51 parks. 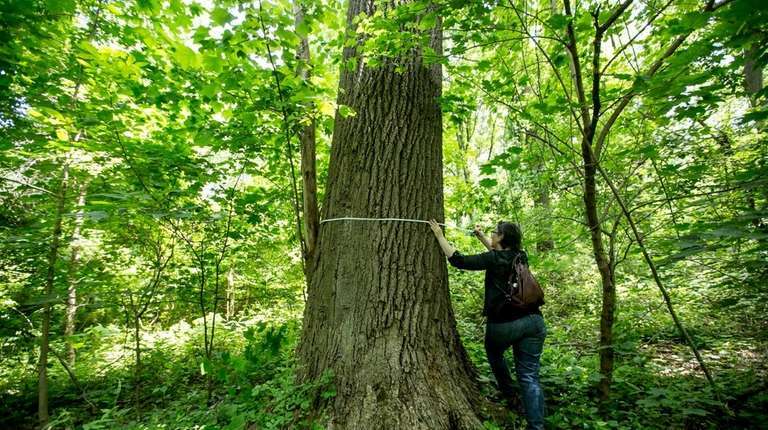 Forgione, senior project manager at the non-profit Natural Areas Conservancy, is in search of what is believed to be the park’s largest tree. Using a map that shows the topography of the park and a compass, she hikes in its direction. “Are you ready for some whacking?’’ she said as she walked between two overturned trees whose 100-year-old roots were exposed after being uprooted by superstorm Sandy. Looking at the darkest shadow on her map, Forgione raised her head as she walked toward a tulip tree taller than 15 stories. The trunk measures a little more than 5 feet in diameter and is surrounded by a cluster of other tall reigning trees “uncommon’’ in a city woodland, she said. Bird watcher and retired postal worker Larry Krasner, 69, of the Hill Top Village Co-operatives in Jamaica, walks from his home to visit one of Cunningham Park’s vernal ponds. The next step is to create trails to guide nature lovers along paths that will not disturb the natural woodlands, she said. The interactive map can be viewed at http://naturalareasnyc.org.